I learned how to make ac chocolate flan cake recipe only recently. I came across a recipe on Eagle Brand products website. Have you ever been so intrigued with a recipe that you simply had to try it? This is the way I felt about this cake recipe. Flan is so popular with many people, especially with my reader friends in Central and South America. The name alone got my attention. Next I was reading how it is made. It is made in layers. Layer one to go in the baking pan is a caramel sauce; like a caramel sauce for flan. Layer two is a chocolate cake batter. The third layer is milk and egg mixture like flan. When this bakes, the flan mixture is suppose to drop to the bottom on top of the caramel and the chocolate cake is suppose to rise to the top of the pan. 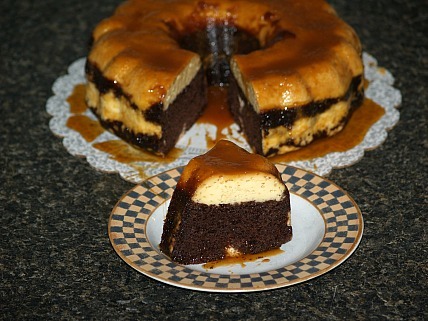 When this cake cools and you invert it onto a plate, the chocolate cake should be on the bottom, the flan mixture on top of the cake and the caramel should be on the top. This recipe calls for a chocolate cake mix and a jar of prepared caramel sauce which I rarely purchase so I did not have any in my pantry. I also like to make everything from scratch for myself but also for all my readers. When it comes to packaged foods, I am not sure if it is available to all my friends in all the countries. I decided to learn how to make a chocolate flan cake recipe from scratch. Preheat oven to 350F degrees; place large pan (to hold Bundt pan) in oven with 2 inches hot water. 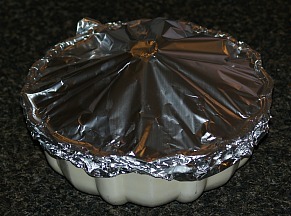 Place rolled up foil in tube of pan to prevent cake from baking over the top. 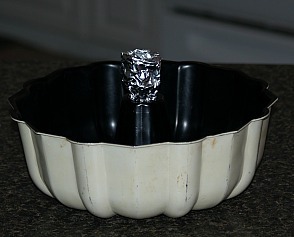 Spray Bundt cake pan with non stick vegetable spray. 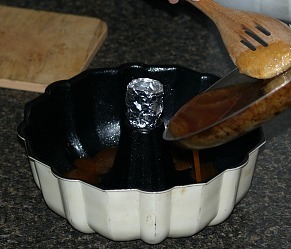 Melt ¾ cup sugar in skillet over medium heat until caramelized; pour into bottom of Bundt pan. For cake sift together in mixing bowl 2 cups sugar, flour, cocoa powder, baking powder, soda and salt. Stir the boiling water into the batter; pour into Bundt cake pan over caramelized sugar. For flan mixture combine cream cheese, eggs, sweetened condensed milk, evaporated milk and vanilla. Pour mixture gently over the cake batter in the pan; cover pan tightly with oiled sprayed foil. Place cake pan in pan of water in oven; bake 2 hours. Cool 15 minutes and remove from pan to plate; cool 1 hour and refrigerate overnight. I learned how to make a chocolate flan cake recipe but when making it from scratch the results were nothing like the picture showed. The white flan mixture blended completely into the chocolate cake as it baked. This might be contributed to my cake batter being thinner; I don’t know. My recipe really is like chocolate flan. The texture is like flan or a steamed pudding; the taste is a delicious smooth moist chocolate. If eaten at room temperature, there is a definite egg taste like in flan. This taste seems to disappear some when refrigerated overnight. Since my recipe did not turn out like the picture, I felt I had to try it exactly the way the recipe was for the picture. I drove to the grocery store and purchased the RIGHT cake mix and the caramel syrup. I was determined to follow the instructions in detail. From the Eagle Brand link above, I printed out this recipe. Preheat oven to 350F degrees; coat 12 cup fluted tube pan with no stick cooking spray. Pour caramel topping into prepared pan. PREPARE CAKE MIX according to package directions using the water, oil and eggs. Pour batter evenly over the caramel topping. Combine cream cheese, eggs, sweetened condensed milk, evaporated milk and vanilla in blender container; blend until smooth. Pour mixture slowly over the cake batter. NOTE: While baking the cake rises and the milk mixture goes to the bottom. 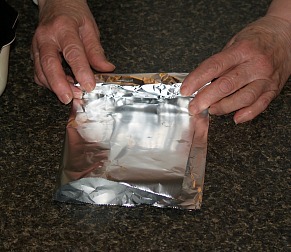 Coat piece of foil with no stick cooking spray; cover pan coated side down, tightly with foil. Place pan in large roasting pan; pour hot water into roasting pan to a depth of 2 inches. Bake 2 hours or until toothpick in center has a few moist crumbs. Place cake on cooling rack; cool 15 minutes. Remove foil and invert onto serving plate. Cool 1 hour at room temperature; chill 4 hours or overnight. As you can see by my pictures, it doesn’t look quite like the original picture, especially on the outside of the cake. The inside looks more like it but as you can see, not the perfection. Where did I go wrong? Or maybe the professional picture is just “too” professional. 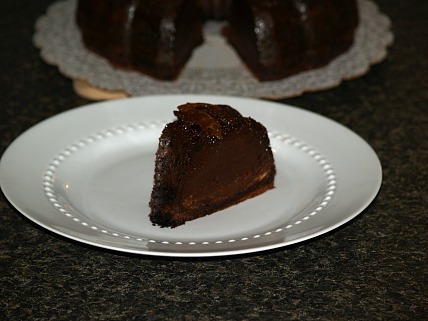 Check out the original chocolate flan cake recipe at the above link and try it. Let me know how your chocolate flan cake recipe turns out. I will say this is a very good cake. 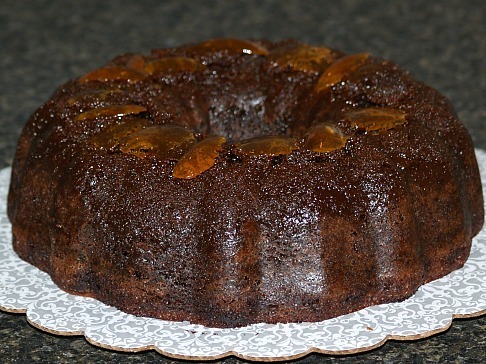 If you like flan and use packaged cake mixes, you will love this recipe. I am not sure how available sweetened condensed milk is in all countries so I have added a recipe to make it from scratch if you cannot buy it. NOTE: HOW TO MAKE SWEETENED CONDENSED MILK? Combine 6 cups whole milk,4 ½ cups sugar, ½ cup butter and 1 vanilla bean in a heavy saucepan. Cook over medium heat for 1 hour until thick and sticky stirring occasionally and cool. The following recipe is not like the chocolate flan cake recipe nor is it like a typical flan recipe. 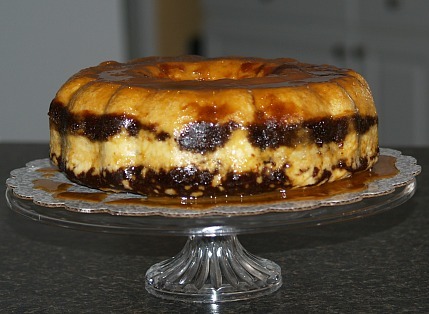 Although it has been titled “flan”, the recipe contains no eggs as is common with all traditional flan recipes. I would say it is more like a mousse but still very delicious. In a saucepan, melt butter in milk over low heat; remove from heat. Mix together powdered sugar and coconut; stir into butter and milk mixture. Lightly butter 8 inch pie plate; spread coconut mixture over bottom and sides of pie plate (not rim). Cut peeled oranges and lemon into chunks; puree in food processor. Stir granulated sugar into fruit puree; set aside. Sprinkle gelatin over ½ cup cold water in top of double boiler; let stand 5 minutes to soften. Dissolve gelatin mixture over hot water; remove from heat and cool. Add fruit puree to gelatin mixture mixing well; refrigerate until consistency of unbeaten egg whites. Fold in egg whipped cream; turn into prepared shell; refrigerate until firm about 1 ½ hours. To serve garnish center with orange sections. The next recipe is also not one like the chocolate flan cake recipe nor is it like the traditional recipes with eggs. I think both of these recipes could better fit into the category of “mousse” rather than flan but since these were called flan when the recipes were given to me I am leaving them at that. Set aside 6 large strawberries for garnish; clean remaining berries and crush in medium bowl. Add lemon juice and cover with sugar; let stand 30 minutes. Sprinkle gelatin over ½ cup cold water in top of double boiler; let set 5 minutes to soften. Dissolve gelatin over hot water, remove from heat and cool. Pour gelatin over crushed berries stirring until sugar is dissolved; refrigerate to consistency of egg white. Beat ¼ cup cream until stiff; gently fold cream and egg white into gelatin mixture only to combine. Turn into cooled pie shell; refrigerate until firm about 1 ½ hours. To serve garnish with remaining whipped cream and berries.